We are excited to update the community on the recent additions and improvements to the MoneroV project. Be sure to get updated and check out the community & ambassador program, join the discussion on Telegram and follow us on Twitter. The team and community are looking forward to expanding the adoption of XMV as a privacy cryptocurrency and blockchain project. You can take part by suggesting improvements, mining, spreading the word or by implementing the MonerovWP plugin on your website. The MoneroV web wallet has been released and can be found on getmonerov.com. 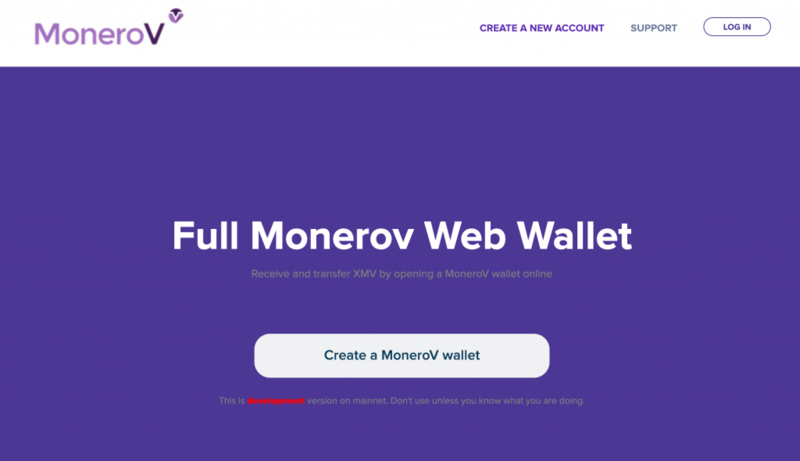 You can now receive and transfer XMV by opening a MoneroV wallet online! This is development version on mainnet. Don’t use the Web Wallet unless you know what you are doing. Please beware as the website or MoneroV team do not store your private login key on the server, there is no way to recover it if it is lost! Your private login key can also never be changed, and if it is stolen or otherwise compromised, you will have to move your funds to a new account with a new private login key. Therefore, it is best that you backup your private login key by writing it down, perhaps obscuring it as part of a poem or letter, and storing it in multiple safe and secure places. This is a web-based interface that allows you to use MoneroV without running a full MoneroV node. However, because this convenience comes at a cost: it is extremely difficult to securely deliver its code to your browser. This means that there is considerable risk in using this service for any amount! It is recommended that you treat this service as you would treat your actual wallet, and not store very large amounts in it. You should consider any amount here as lost. For long-term storage of MoneroV you should preferably create a cold wallet. C++ developer with at least two years of Qt experience and experience with blockchain protocols. Full or part-time work opportunity to work on the MoneroV GUI. Community and outreach manager with proven knowledge working on a CryptoNote / Privacy based blockchain project. Help expand social media reach, outreach campaigns and be in charge of 3rd party merchant integration (to include XMV) from start to finish.